This study aimed to standardize the surgical correction technique of congenital Morgagni diaphragmatic hernia (CMDH), analyzing the results of an international multicentric survey. The medical records of 43 patients (29 boys, 14 girls) who underwent laparoscopic repair of CMDH in 8 pediatric surgery units in a 5-year period were retrospectively reviewed. Their average age was 3.3 years. Ten patients (23.2%) presented associated malformations: 9 Down syndrome (20.9%) and 1 palate cleft (2.3%). Thirty-five patients (81.4%) were asymptomatic, whereas 8 patients (18.6%) presented symptoms such as respiratory distress, cough or abdominal pain. As for preoperative work-up, all patients received a chest X-ray (100%), 15/43 (34.8%) a CT scan, 8/43 (18.6%) a barium enema and 4/43 (9.3%) a US. No conversion to open surgery was reported. Average operative time was 61.2 min (range 45–110 min). In 38/43 (88.3%) patients, a trans-parietal stitch was positioned in order to reduce the tension during the repair. In 14/43 cases (32.5%), the sac was resected; in only 1/43 case (2.3%) a dual mesh of goretex was adopted to reinforce the closure. Average hospital stay was 2.8 days. The average follow-up was 4.2 years, and it consisted in annual clinical controls and chest X-ray. We recorded 2 complications (4.6%): one small pleural opening that required no drain and one recurrence (2.3%), re-operated in laparoscopy, with no further recurrence. To the best of our knowledge, this is the largest series published in the literature on this topic. Laparoscopic CMDH repair is well standardized: The full-thickness anterior abdominal wall repair using non-resorbable suture with interrupted stitches is the technique of choice. Postoperative outcome was excellent. Recurrence rate was very low, about 2% in our series. 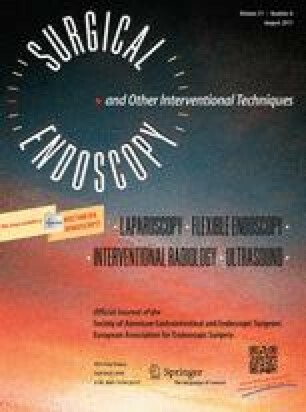 We believe that children with CMDH should be always treated in laparoscopy following the technical details reported in this paper. Ciro Esposito, Maria Escolino, Francois Varlet, Amulya Saxena, Sabine Irtan, Paul Philippe, Alessandro Settimi, Mariapina Cerulo, Holger Till, Francois Becmeur and George W. Holcomb 3rd have no conflict of interest or financial ties to disclose.